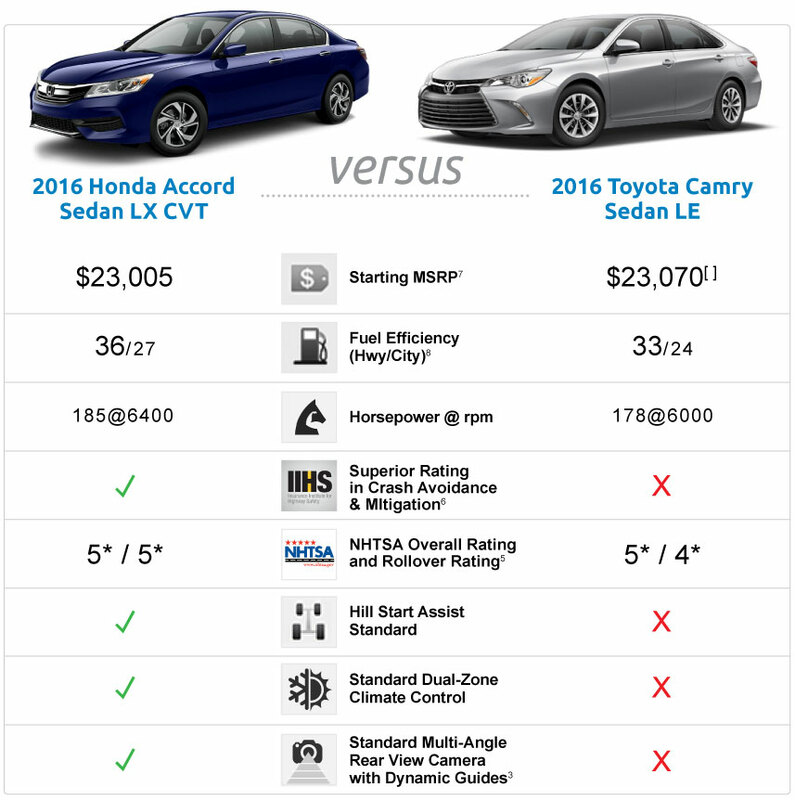 Long-time American favorites, we take a look and compare two of the most popular mid-size cars in America today: the 2017 Honda Accord versus the 2017 Toyota Camry. Right out of the gate, the Honda Accord dominates in both style and diversity, offering coupe, sedan and hybrid models with a strong stance, defined curves and sporty appearance. With these diverse body styles, the Accord is perfectly suited for many different walks of life, including active individuals and couples with friends and gear, as well as families of 5 on-the-go, all desiring a stylish vehicle with modern functionality and connectivity. 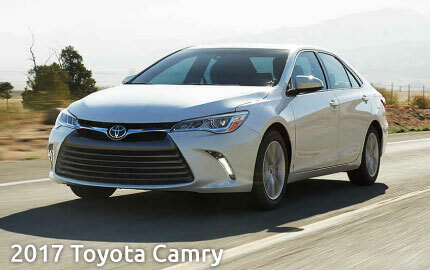 While still a popular option appealing to a mass market, the Toyota Camry only comes in a 4-door sedan (including Hybrid model) and in a somewhat more plain, less attractive body. Both designed for carrying up to 5 people and a reasonable amount of gear, the Accord and Camry offer many features you have come to expect in a best-seller, such as Bluetooth®,2 MP3 Player, Backup Camera,3 Miles to Empty Indicator, and much more, standard on all trim levels. While both the Accord and Camry include an Audio Touch-Screen Interface with all models, all Accords include an i-MID 8“ High-Resolution WVGA (800×480) Display, as compared to the Camry’s much smaller 6.1” Touch-Screen Display on the LE and SE models, increasing to a still smaller 7.0” option on the higher level Camry models (XLE and XSE). As we continue to explore, although both vehicles offer a standard backup camera, all 2017 Honda Accords include an upgraded Multi-Angle Rearview Camera with Dynamic Guidelines3 for maximum rear visibility, as well as advanced technologies like Dual-Zone Climate Control, SMS Text Message Function, Radio Data System (RDS), Pandora4 Compatibility, and Speed-Sensitive Volume Control (SVC), all standard on even the base model Accord. Click here to further explore 2017 Honda Accord photos, videos, features, and offers. Overall, the 2017 Accord brings more to you for a slightly lower Base Price MSRP.7 Proudly strut a sleeker outward appearance, while inside you enjoy the Dual-Zone Climate Control, larger Touch-Screen, Connectivity apps like Pandora4 and Text Messaging, and other added value and convenience features in even the Accord’s base model, all for a slightly lower price than the Camry. The 2017 Honda Accord proves to be a smart choice, and a stylish, safe and fuel-efficient drive that will keep you looking good and connected during your many life adventures on the road. Explore the 2017 Honda Accord Photos & Features Now! 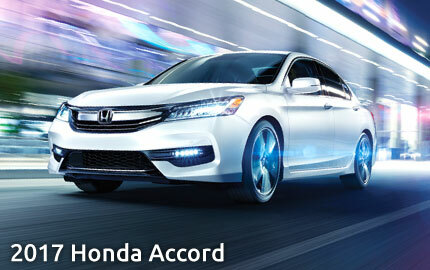 For more information on the latest Honda technologies and features available in the new Accord, as well as the great deals we have available, simply give us a call at (585) 978-3070 to setup your personal Accord test drive experience, so you can explore these cutting edge advances first-hand, or select an option below. All information presented on this page was obtained directly from Automobiles.Honda.com, Toyota.com, TheCarConnection.com, SaferCar.gov, and IIHS.org. Information is deemed to be accurate but cannot be guaranteed. Consumers are welcome to independently verify all facts against manufacturer data and to contact us with any questions, using the form above. 1 Per The Car Connection. Details at Civic: http://www.thecarconnection.com/overview/honda_accord-sdn_2017, Camry: http://www.thecarconnection.com/overview/toyota_camry_2017. 2 The Bluetooth® word mark and logos are owned by the Bluetooth SIG, Inc., and any use of such marks by Honda Motor Co., Ltd., is under license. 3 Always visually confirm that it is safe to drive before backing up; the rearview camera display does not provide complete information about all conditions and objects at the rear of your vehicle. 4 Pandora®, the Pandora® logo, and the Pandora® trade dress are trademarks or registered trademarks of Pandora® Media, Inc. Used with permission. Compatible with select smartphones. See: www.pandora.com/everywhere/mobile. Not all devices compatible with USB connection. Your wireless carrier’s rate plans apply. 7 Manufacturer’s Suggested Retail Price excludes taxes, license, registration/title, optional or regionally required equipment and destination charge. Dealer prices may vary. 8 23 city / 32 highway / 26 combined mpg rating for 6MT models. 27 city / 36 highway / 30 combined mpg rating for CVT models. 26 city / 34 highway / 29 combined mpg rating for Sport CVT models. 21 city / 33 highway / 25 combined mpg rating for V-6 models. Based on 2017 EPA mileage ratings. Use for comparison purposes only. Your mileage will vary depending on how you drive and maintain your vehicle, driving conditions and other factors.